Again, we see some batteries skipped in the order. In this case the 13th and 14th. 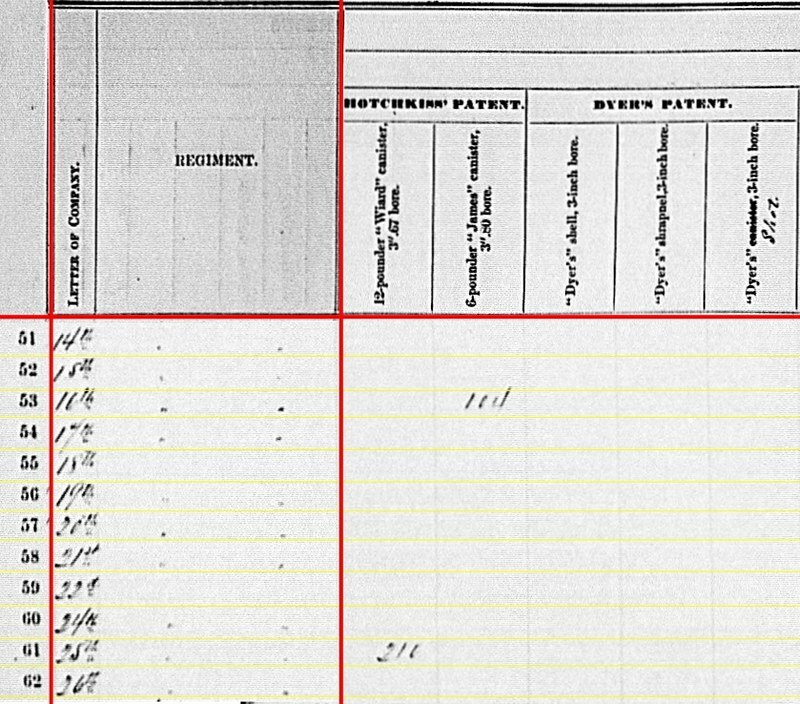 Of the six reporting, two have returns not posted until 1864. In addition, just to say we’ve had a complete look, there were some batteries, beyond the 20th, which deserve mention. 11th Battery: No report. 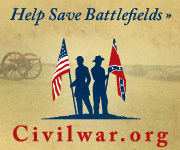 Was part of the Seventh Division, Left Wing, Thirteenth Corps and camped around Germantown, Tennessee, outside Memphis. Captain Frank C. Sands commanding. 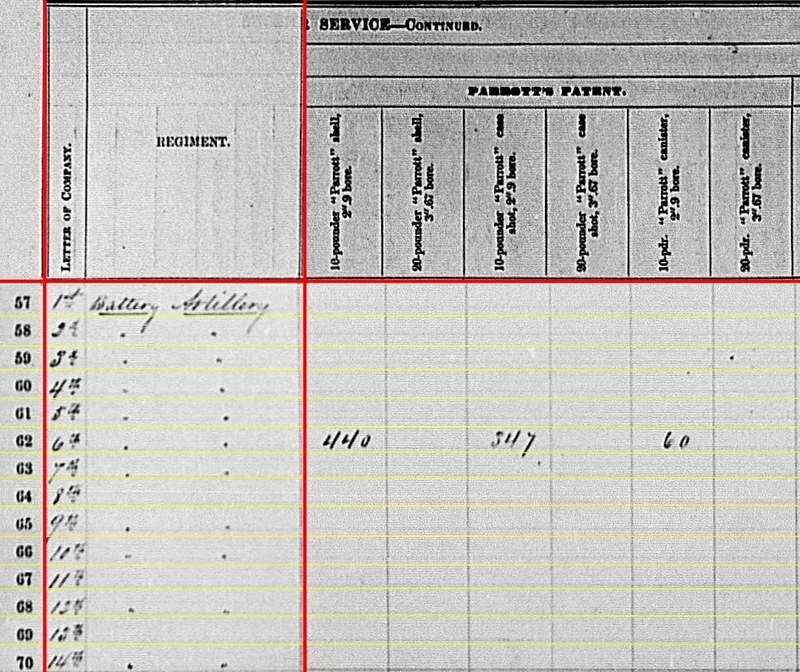 UPDATE: Phil Spaugy has a great post up about the 11th Battery in action at Iuka. 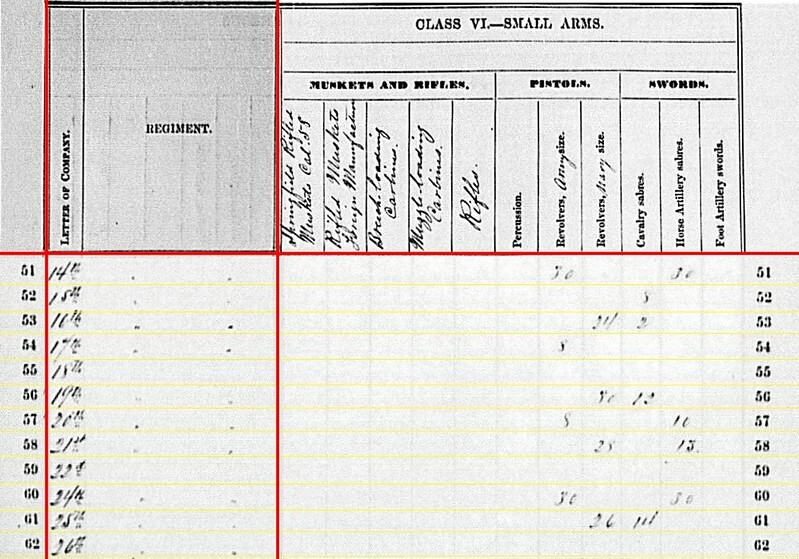 He passed along a source indicating the battery had two 3.67-inch rifles, two 6-pdr field guns, and two 12-pdr field howitzers at Iuka in September 1862. 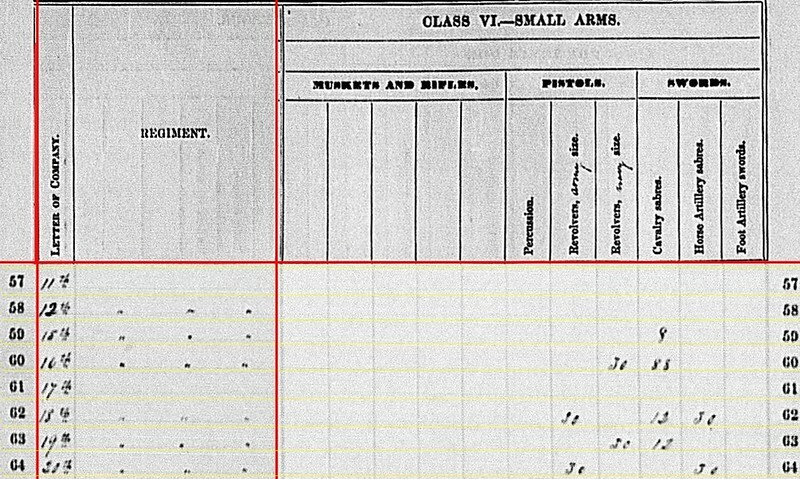 12th Battery: At Falmouth, Virginia with six 3-inch Ordnance Rifles. Captain Aaron C. Johnson commanded this battery assigned to the Eleventh corps. 13th Battery: Not listed. Losing all its guns at Shiloh, this battery ceased to exist after April 1862. 14th Battery: Not listed. The battery part of the District of Jackson (though at Lynnville, Tennessee), Thirteenth Corps at this time, under Lieutenant Homer H. Stull. 15th Battery: Tallahachie, Mississippi with four 6-pdr field guns. The 15th was involved with Grant’s Northern Mississippi , as part of the Fourth Division, Right Wing, Thirteenth Corps. Captain Edward Spear, Jr. commanded. 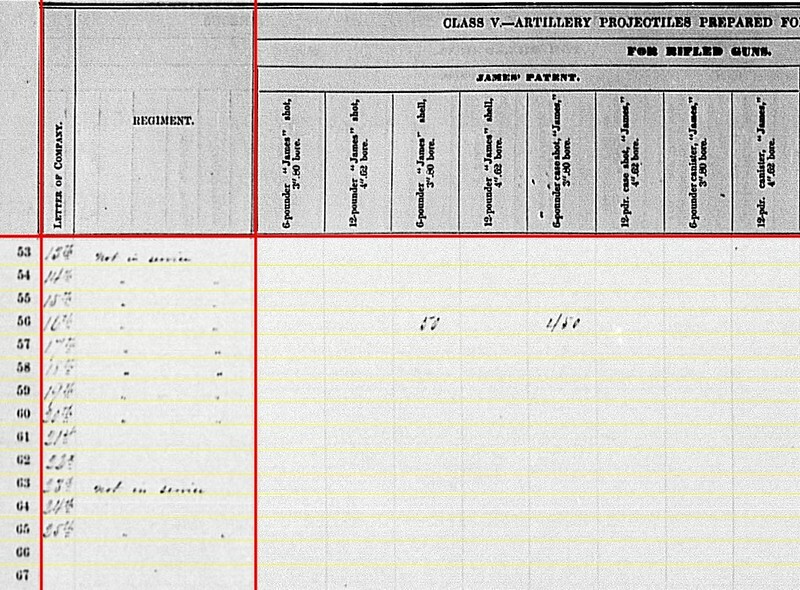 16th Battery: No location given, but with two 6-pdr field guns and four 3.80-inch James Rifles. Lieutenant Russell Twist commanded this battery at Helena, assigned to District of Eastern Arkansas, in the Department of Missouri. But the battery was soon to be pulled into the Vicksburg Campaign. 17th Battery: No report. Captain Ambrose A. Blount commanded this battery. Blount’s battery was among the unattached artillery supporting Sherman’s failed attempt at Chickasaw Bayou that December. 18th Battery: Nashville, Tennessee with six 3-inch Ordnance Rifles. 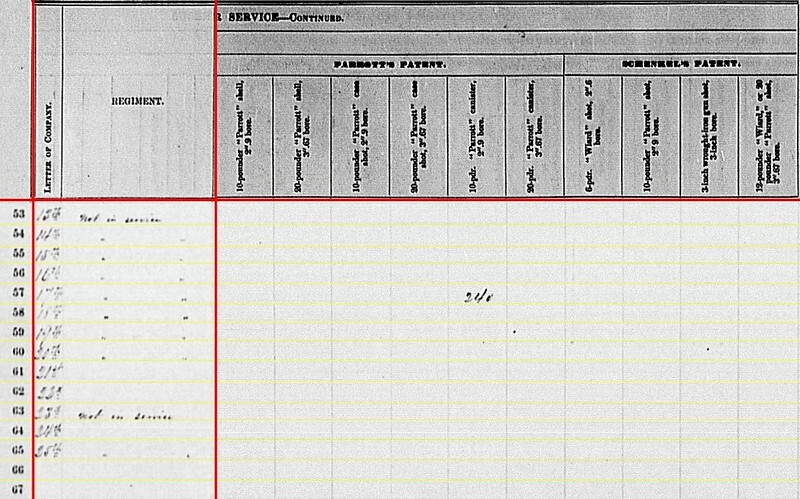 The location may be valid for March 1863, as received in Washington. However, at the close of 1862, Captain Charles Aleshire’s battery had just arrived in Lousiville, Kentucky, as part of Second Division, Army of Kentucky. 19th Battery: Knoxville, Tennessee with six 12-pdr Napoleons. The 19th, under Captain Joseph C. Shield, was also in Second Division, Army of Kentucky, but moving towards Frankfort at the close of 1862. 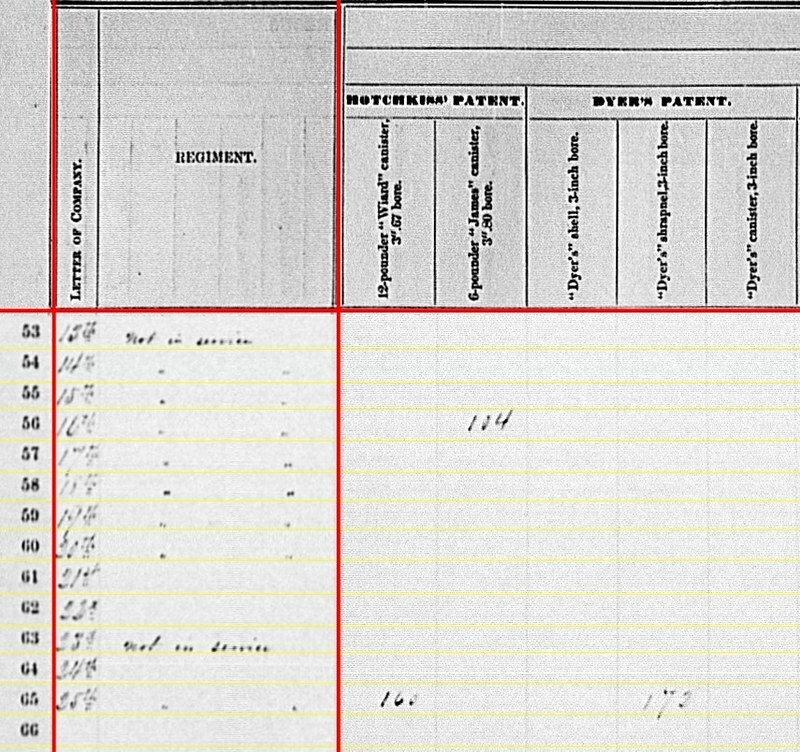 The Knoxville location was valid for February 1864, when the return was posted to Washington. 20th Battery: Nashville, Tennessee with two 12-pdr Napoleons and four 3-inch Ordnance rifles. 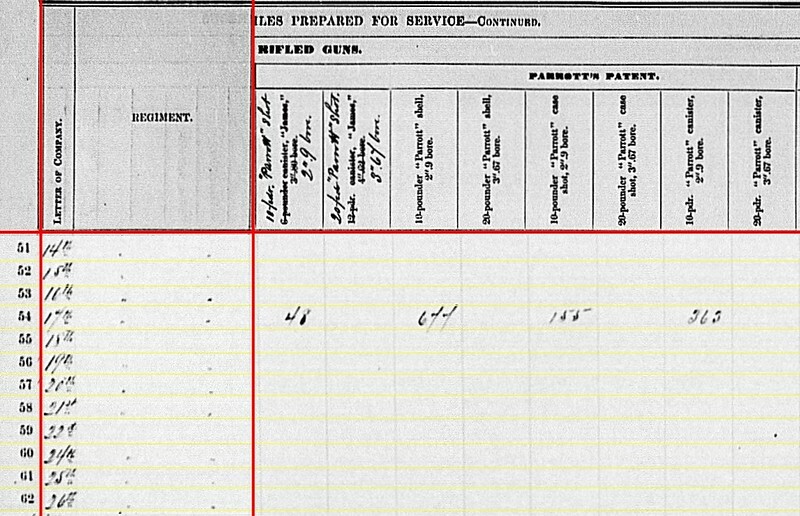 The 20th, under Captain Edward Grosskopff (formerly of the 10th Ohio Independent Battery), arrived a few days late to participate in the Battle of Stones River. They were, at that time, not assigned to a field formation. 21st Battery, 22nd Battery, and 24th Battery: Not organized until later in 1863. 23rd Battery: Not listed. Mustered in 1861, this battery was attached to 2nd Kentucky Infantry. It became the 1st Kentucky Independent Light Battery. 25th Battery: Not listed. Formed as the 3rd Battery Kansas Artillery, this battery was re-designated as the 25th Ohio Independent Light Battery in February 1863. So I figure we should have entries for nine batteries, but only six have reports tallied. We work with what is there. 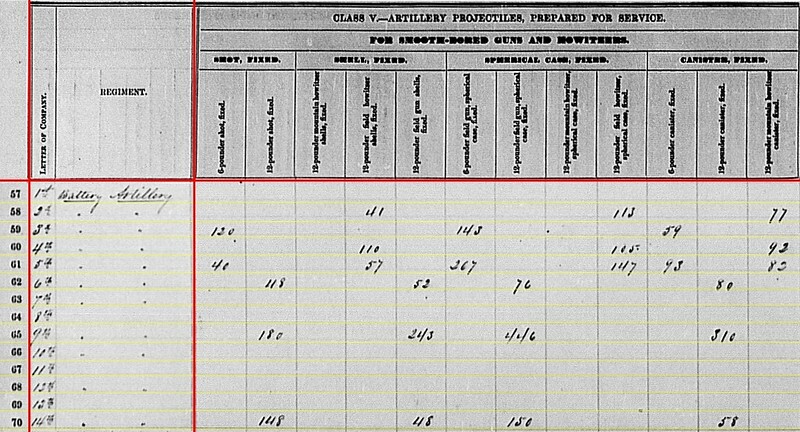 15th Battery: For 6-pdr field guns – 412 shot, 256 case, and 164 canister. 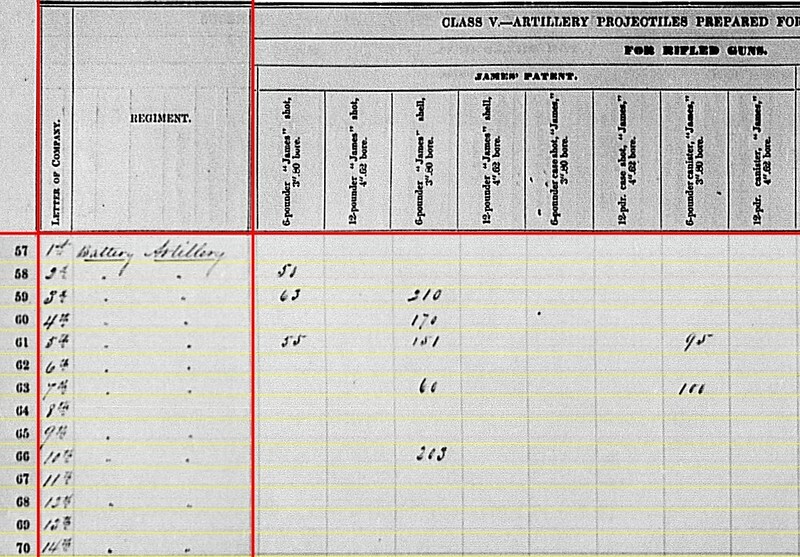 16th Battery: For 6-pdr field guns – 210 shot, 167 case, and 98 canister. 19th Battery: For 12-pdr Napoleons – 96 shot, 358 shell, 306 case, and 222 canister. 20th Battery: For 12-pdr Napoleons – 150 shot, 50 shell, 150 case, and 50 canister. 12th Battery: 350(or 250?) fuse shell and 730 bullet shell for 3-inch rifles. 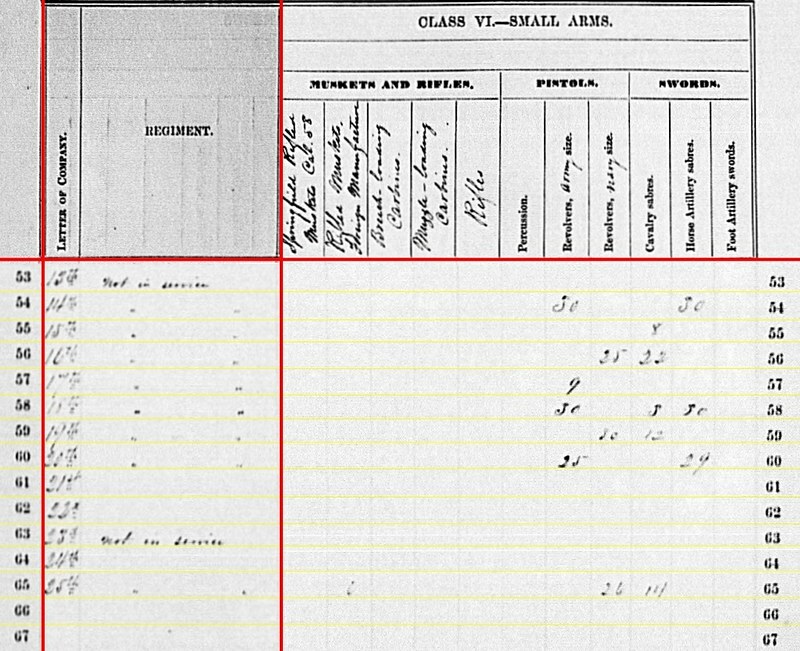 16th Battery: 340 shot and 340 fuse shell for 3.80-inch James Rifles. 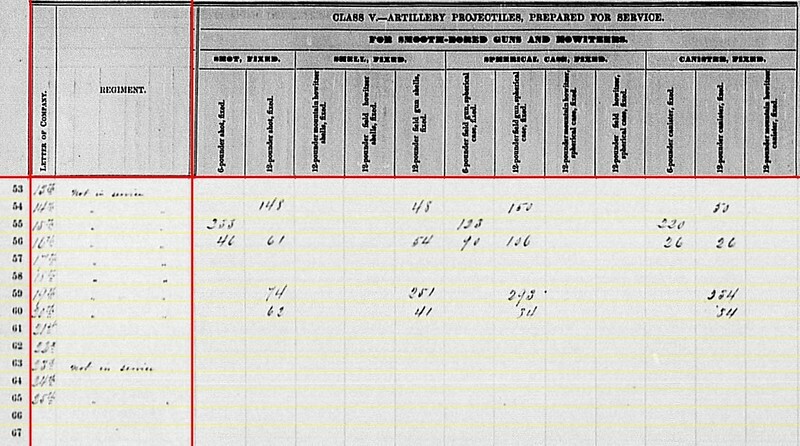 18th Battery: 144 canister, 225 percussion shell, 530 fuse shell, and 480 bullet shell for 3-inch rifles. 20th Battery: 100 canister, 160 percussion shell, 160 fuse shell, and 375 bullet shell for 3-inch rifles. 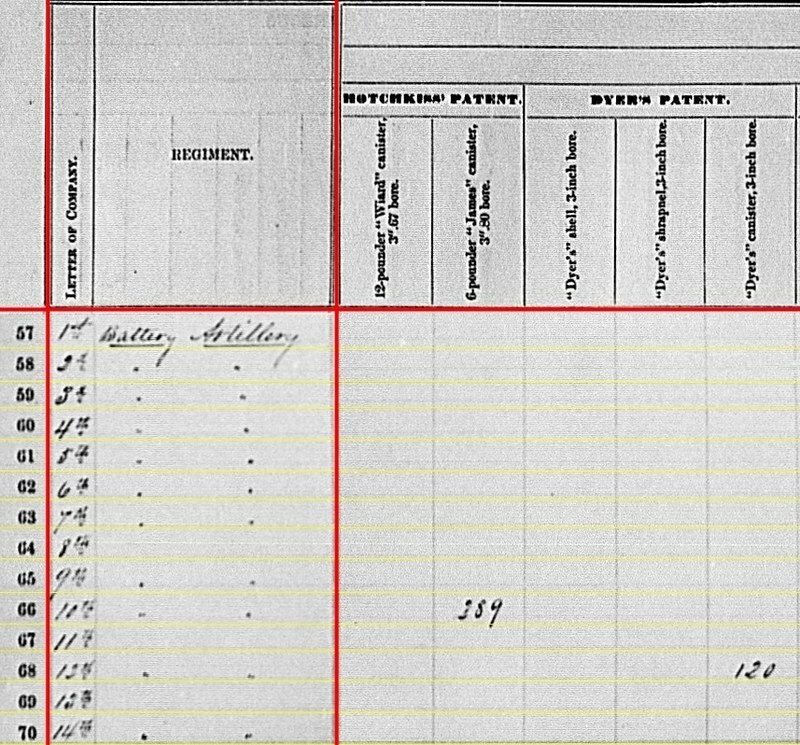 12th Battery reported 125 3-inch Dyer’s canister. 12th Battery also had 125 3-inch Schenkl shells. 16th Battery had 136(?) of Tatham’s canister for their 3.80-inch rifles. 16th Battery: Thirty Navy revolvers and eighty-eight cavalry sabers. 18th Battery: Thirty Army revolvers, twelve cavalry sabers, and thirty horse artillery sabers. 20th Battery: Thirty Army revolvers and thirty horse artillery sabers. So of those reporting, only the 12th Battery indicated no small arms on hand. Somehow I think that an omission of some sort.